This is one of those very simple Italian vegetable dishes traditionally served before or after the main course. Try it as a side dish with grilled fish, or as a starter, topped with curls of parmesan. Preheat the oven to 230¢ªC/gas 8, or as hot as it will go. Bring a pan of water to the boil. 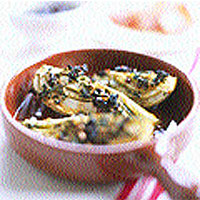 Drop in the fennel and blanch for 2 minutes. Drain then arrange in a gratin dish in a single layer. Pour in the wine and lemon juice, season with sugar, salt and pepper and trickle with the oil. Bake for about 20 minutes until the edges of the fennel are browned - the inside should retain a little bite. Sprinkle with the lemon zest, olives, parsley and garlic and return to the oven for another 5 minutes to blend the flavours. Cool to room temperature. Before serving, drizzle with a little extra virgin oil and a drop of balsamic vinegar (this is a chance to use one of the ferociously expensive but utterly delectable barrel-matured Tradizionales from Modena).